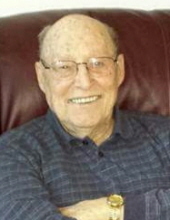 Age 87 of Owosso passed away Wednesday, March 27, 2019 at his home. Norman was born September 6, 1931 in Flint; the son of Norman G. and Clara (Jennings) Williams. He graduated from Central High School in Flint. Norman proudly served his country in the United States Army during the Korean War as a radio operator. Norman was a member of the VFW, the American Red Cross and was an amateur radio operator. He married Marlene Jepson in Flint, Michigan. Norman retired from Consumers Energy on July 1, 1986 after 32 years of service as a gas service foreman. Norman is survived by his daughter Lisa (Martin) Howard; granddaughter Ashley L. Howard, all of Waterford and many other loving family and friends. He was predeceased by his wife Marlene M. Jepson and daughter Laura L. Williams. A very special thank you to his dear friends Al Langdon, Beverly Dews and Care and Assist of Corunna. Memorial contributions are suggested to the Alzheimer's Association. To send flowers or a remembrance gift to the family of Norman Douglas Williams, please visit our Tribute Store. "Email Address" would like to share the life celebration of Norman Douglas Williams. Click on the "link" to go to share a favorite memory or leave a condolence message for the family.